This template is a bit buggy on firefox, and it seems to have some odd behaviors on IE as well. 1. The # of comments shows, but you have to mouse over it to see the word "comments". 2. In Firefox, when you click on Comments, the dialog boxes are pre-populated with garbage text. This isn't the case on IE. 3. Email this Post doesn't show up by default - it only shows up when you have the comments open. And once again, in Firefox, the dialogs are pre-populated with crap. Once again, not so with IE. I *do* love the template, though..very elegant, clean and readable. Nicely done! Thanks for your feedback on these few minor topics. 1. On The original too. 2. I am working to resolve this problem. Hi, I've been trying to figure out the way to edit/delete comments, after I applied this template. I'll be really grateful if someone could tell me the steps, or point me to the relevant section. now, how do i get the white background all the way to the bottom of the page? How can you edit/delete comments! Any help would be appreciated. Thanks very much for this template. I also would like to know how to delete comments. I have looked and can't find an option for this, and I am not great with the code so I would appreciate any advice. Thanks in advance for the help and for the great template. I've disabled all 3 items, and although it says I have new comments, you cannot see them anywhere - any progress on fixing this? My only question is-- how do I get the googlebar back?? hey, great templates...cool..keep it work. I did exactly what you wrote about "how to add a delete comment icon in the code" it doesn't work :S... any suggestions would help! there is link called view blog besides templates, setting etc. once you click one window will open then go to comments and delete it..
are you remembering to replace the ( brackets with the < ones? yep I did exactly that..replace the ( brackets with < these ones; the delete icon doesnt appear anywhere... could there be something else that I may be messing up?? Maybe it would help me...if u can let me know where the icon should actually appear! Someone can tell me how to implement visualization of last comments in blog homepage in the right side bar as in the http://www.ejecutive.co.uk/ (under "ABOUT") ? I see that in Bloger there isn't this option and i don't know how to do it. And how can i do to implement the "continue reading" in a long post ? Which are lines codes to insert ? Thanks a lot (from Italy)! Thanks a lot Rajesh ! You are a very humanity benefactor !! 1) Now I've implemented (finally) "Continue reading" in my blog (I don't understand how hide "continue reading" in posts where there isn't necessity : at this time "continue reading" appear in all posts). But this is a very little problem. Hi Rajesh and again Thanks a lot !!! Copy that into the sidebar area of your template (or wherever you'd like it to display), then save and republish and you should be all set. Read on for a quick walk-through of the code. Finally I have also last comments. Does anyone know how to add a contact form like this http://vysnu.com/contact/ to the blog? Rajesh your blog is nice buddy. I would like to know how to get that text inside light grey boxes. I am not great with the codes. So can you tell me what to do in detail? Thank you Rakesh. Its working. But i would really like to know how to add that contact form (check this for an eg: http://sig9.com/sctalumni/contact/). That site is using the old kubrick template. I think contact form can be incorporated into blogger too. But i am not that much great in coding. Bye for now. This is the contact form css which is used on that site. But i dont know how to add that to blogger. Anyway u try. 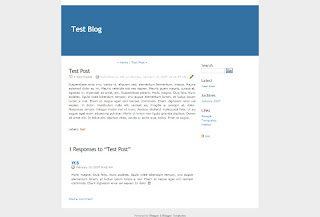 Something wrong with my blog, when I apply this template the fonts of some postings and the side-bar become blurred. However those blurred fonts appear on the home page (http://origena.blogspot.com) only and not in other pages. I tried to apply the template to my other blog, it worked well on all pages. I really don't know what causes it. Suman @- 1st thing is that i'm Rajesh not Rakesh, i think u took this css sig9 blog which is running by wordpress which run on php platform that has different coding system,well if you have carefully analysed www.aimk.blogspot.com there you have saw contact option, in blogger we don't get that much flexibility for creating diffrent pages but what we can do is that we can make new blog for contact and chnage comments into contact details and let those contact details feed into your email inbox so that you can be contacted, and incorporate those two weblogs into one blog. Origena @- best thing for you is to reinstall whole template which hardly takes 5 minutes but don't forget to keep back up of you old template in notepad.. do let me know about results.. I already tried it before, but the result was the same as now, as I re-install the original one again. I also tried K1 black & K1 template, both resulted the same problem. My blog didn't have this problem when I used Google theme template.Weird. Hope you can help to sort it out that problem. at the end of entry. Thank you! After trying 10 different templates I think I have finally settled. Thanks for letting me know the codes for the "search archives" ... now I just had one more request :P...I was wondering if you can tell me how I could make different subtopics for my posts; for example: I want to move my most recent post to a subsection on "poetry" or "General Stuff"...do you get what I am saying?? Anyways any help would be appreciated! Do you mean categorizing your post??? Its not possible in blogger. I think Rajesh will give you a better solution to your request. Sweet stuff! Thanks for template! How can i change the background colour? Can we use Wordpress with blogger.com...?? These templates are all reall great, but how come you guys haven't worked on fixing the garbage code in comments and allowing word verfication? It seems to be a recurring problem that a lot of people are hassling you about. This one is using Categories. Since Nobody has pointed out I thought I will pitch in. Regarding the bug in Firefox, in which the comments text boxes are pre-populated with garbage text. This is something to do with cookie. Hope this help, u can give it a try at my blog! @ Rajesh and Ramesh: This is one site that uses categorization with K2 blog template... www.jamalsadik.com.... but the thing is this guy host's his own site..but checking it out might be worth a try. Apply these changes to the css, properties prefix with "_" will only affect IE6. gazard : thanx you very much... i'll check it out..
You should rectify the template now. Because it's not very easy to understand all these modifications. How can you fix the white background all the way to the bottom of the page? How to fix the white background (in Firefox) which now it is half way to the bottom of the page? I am having troubles with this template. I an unable to post a title for my post with this template. Though I am not using this template, but I like this one very much. Reason is Its simple and you even can change some description of your header. If I was not using my current blog template it certainly would be this! I notice if I have multiple comments, they get smaller and smaller until they're unreadable (www.kvitsh.blogspot.com), but your blog (http://www.rajeshrana.blogspot.com/) doesn't have this problem. Where/how can I fix it? Seems like K2 is one your most popular. Good work! Have you fix the firefox comments problem? Hi great template, but I am unable to show the comment deletion icon. I am sure it is there, because I can click an area in the page and the comment gets deleted however the icon does not show. Do you have any idea about how to modified it? Is there any chance that we'll be seeing a Blogger Templates version of Michael Heilemann's K2 Beta Two template? It would be really cool! too bad still don't know how to use word verification. Anyone? I think so, cos it works for mine. I have applied this template and I really like it. One thing though. My banner at the top of the page looks good in IE, but looks strangely misplaced in Firefox. Doesn anybody have an idea how to fix that? Great template! Tweaked it just a little bit and it works really well. Great Template, thanks a lot! Is there any way to solve this problem in another way? I love the template but have a question.. I'm experiencing a problem in Safari/Firefox: the white field/square (in which posts are displayed) does not reach to the bottom of the page. See http://www.quoileternite.blogspot.com/. In IE it looks fine. Any suggestions? How do I replace the blue header with an image? How do I get the navbar back? I added a link to this template since it's really what I was looking for and quite easy to adapt to specific needs. Thanks for the great template. Clean and simple. This template is awesome. The only problem is with the comment box. I cannot activate the checkbox so that SPAM doesn't come through. Will there be an update? My blog has a lot of comment traffic and i have to moderate all the comments to keep things clean and i get dozens of SPAM messages a day. I'm simply fed up with it. Does someone have a solution? Thanks. Thanks for the template.I have tweaked it to make it look like K2 beta 2.It rocks.Have a look. Is there anyone using Japanese font? Comments in Japanese don't appear correctly. Does anyone have solution to this? Excellent template. Simple and elegant. I'm using a slightly modified version for my blog. Great work. How do I use a tiled image as a background, inplace of the white? Great template. Thank you very much. i just wan to say this design is nice. thank you! Here is my take on K2 Beta Two r157. It's not a perfect port some css code needs to be cleaned up but the good thing is it works with blogger.com. Just installed K2. Cannot get the comments to work. Please help me with a simple answer. I've read all the previous messages and have not yet solved the problem. Thank you VERY much for the template. It's very cool. I haven't seen any mention of changing the header. I'd love to know where to plug my own header code in and replace the blue box. Thanks. I have the same problem San is having. If you use Firefox, then delete your cached cookies and turn off the form save utility in the privacy options. Might help or might not. Works at random for me. A permanent fix would be awesome. comments text boxes are pre-populated with garbage text. This is something to do with cookie. Thanks you so much 1ijack !! K2 is a classic template that will be around for a very long time. The problem is too many people are using this theme. If people are creative enough they can easily modify it into works of art. 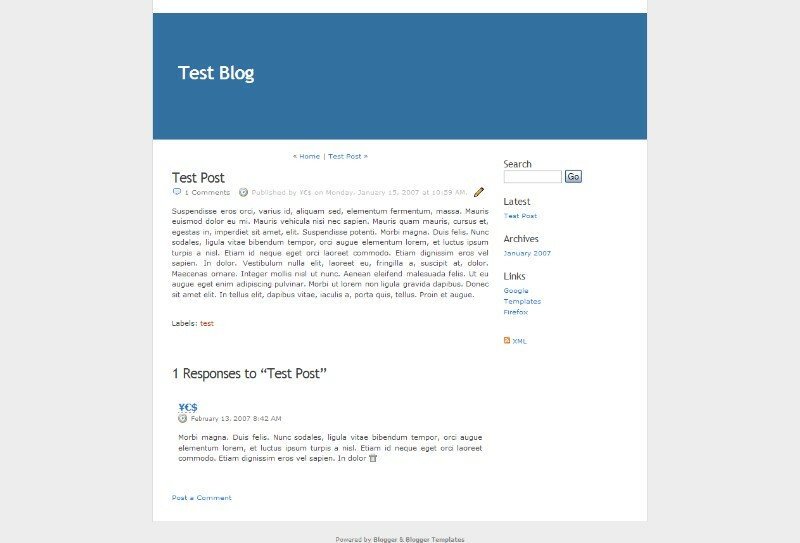 This K2 blogger theme is a good starting point to creating your own unique template.